It’s finally here! We are finally moving toward the end of summer and beginning to look forward to fall. For all the devout fashion followers out there, you know that we don’t have to actually wait for the fall styles to hit stores, because there’s a nifty “mini season” to help us transition. It’s called pre-fall. Pre-fall styles usually consist of some transitional pieces pulling both from summertime favourites and upcoming autumn looks that can be worn a bit early. Luckily for us, accessorising has gotten easier in recent months. First the choker came onto the scene, then it was bandanas tied around the neck, and now it’s silk scarves that are having a moment. You can choose to tie it like a neckerchief, or you can take a page out of DVF’s 2016 pre-fall collection on Fashion Times and let it dangle free, draped around the nape of your neck. Silk scarves are great for adding a pop of colour and a bit of whimsy. If you were hoping for something a little more sultry this season, you’ll be happy to hear that slip dresses are continuing their climb. These slinky little numbers are great for a night out, but if you want to change it up for daytime (or you’re just a bit more modest), simply throw a turtleneck, fitted T-shirt, or even a button-up underneath the dress. It’s the all-new cool-girl look. Forget what you thought you knew about floral prints; the blooms are not just meant for spring and summer wardrobes anymore. Even Real Simple called the print “fall’s most wearable trend.” For your floral fix heading into pre-fall, look for midi frocks with flower prints in autumnal colours and romantic cuts. You will feel oh-so-feminine! The '70s are holding strong to the fashion trend scene, seeing as the decade has dictated many of the styles to come from designers for a whole year now. With that being said, it seems that the '70s aren’t going away anytime soon. Inspired by the era are the must-have shoes of the season: block heels. Practical and super stylish, block heels bring a whole new level of chicness to any outfit. Somehow, designers have found a way to transition off-the-shoulder tops from spring and summer into fall. 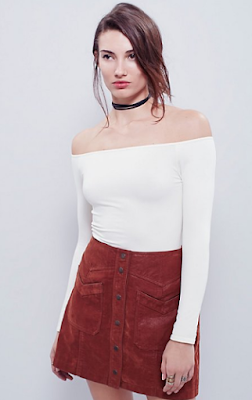 Lyst is showing all kinds of fall-friendly bare-shouldered tops, and I’m not complaining! These flirtatious and endlessly flattering styles are perfect to blend into your pre-fall ensembles when paired with frayed-hem denim and velvet skirts.